I’ve done some work on the CNC machine yesterday and I was able to engrave some really fine text onto plastic. This is the first application for the machine that I have in mind. At work we make some hardware. I’d like to engrave the serial numbers in those cases. 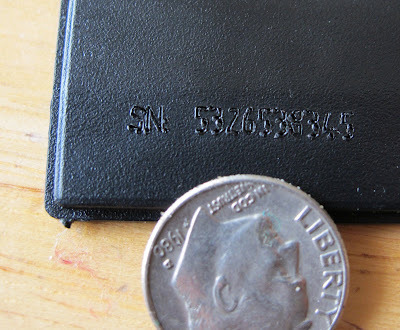 As you can see the engraving can easily be done at a lower laser power. Which leads me to the realization I need control over the laser power from EMC2. Maybe Drive4Die or Flexmod. Also it looks like I’m going to need control over the Z axis to focus the laser on different height materials without having to refocus every time. I’ve also noticed the machine isn’t quite orthogonal, which is not too much of a surprise :). I’ll have to work on that a bit as well. All in all it’s looking very good.